I used to live near the Katong area in Singapore in the period of 91-93. Katong Shopping Centre was within walking distance and I used to frequent the place. During it's heydays, Katong Shopping Centre was the mall of the east. That was before Parkway Parade was built. Within KSC those days, you can find billiard saloons, food courts, computer shops, pet store, comics store, contractors, maid agencies, shop that sells cloth by the yard, KTV lounge, KTV equipment store, copy printing stores, shoes shop, shop selling cheap fragrance, shampoo, beauty products and even a bowling alley at the top storey. For me, it was the PC shops that attracted me then. The walk to KSC was about 3-4km, not exactly near, but I'd always find excuses to visit KSC. Though by the 90's, it was already pretty rundown and oldish compared to the newer malls, the mall had this nostalgic feel as if it was stuck in the 80s. Back then, there were numerous PC shops there. Most of them sells pirated softwares and games, which attracted quite a lot of young children and teenagers. But they also attracted the law. These shops open and close so often due to police raids, it's hard to keep track how many PC shops except for 2 shops which was there the longest time. Basic Computer and HardWareHouse. The first shop is no longer around but I believe HWH still exists in Sim Lim Square. Not sure if they are the same though. 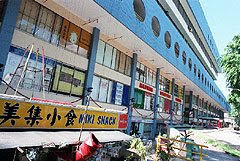 The second storey used to be made up of a myriad of copy printing shops, which takes up almost half the floor near the escalator, and smaller shops which consists of the KTV equipment shop, shoe shop, some contractors near the end of the floor and a few maid agencies. So much fond memories of the place. I believe, I can remember most of the shops and its staff ,whom used to work there, with my eyes closed. Last weekend, I revisited the place again after a long absence. Upon entering the KSC, I could instantly remember the smell, that sadly was the only thing familiar. So much of KSC had changed. I was happy to see some shops still around. The shoe shop, the copy printing shops and the KTV equipment store were still there. KSC now is made up mostly of maid agencies and contractors. It had seemed to have lost its Peranakan charm. Katong, from as far back as I can remember, was the place to be. Even before Bukit Timah. District 15 aka Katong was the place to be living in if you want to show off how well-to-do you are. Many well-to-do Peranakan families preferred to live there and their closely knitted communities also meant that many businesses related to Peranakan culture sprout in the Katong area and flourished those days. Especially in the business of food, you will still be able to find quite a selection of Peranakan food in the area near to KSC. As I was leaving KSC that day, I saw something interesting. It was typical Chinese Geomancy shop. The shop sign has both the chinese name and a completely unrelated english name. Some more nostalgia of Katong and KSC here. If you come across anymore nostalgic stories or images of Katong, kindly let me know. I miss that period of Katong so so much. How I got my wife and 3 other women pregnant!